There's more to a whiskey glass than just the glass itself; it can help make a toast, a new memory and even new friends! Now, you can take that same old boring glass and completely customize it, making it even more special. There's nothing quite like taking a sip of your favorite scotch or whiskey from a beautifully designed and personalized whiskey glass. Now, that you've imagined the fun and memories you can make with one of our custom whiskey and scotch glasses, you've got to decide which of our personalized scotch and whiskey glasses fits your drinking style. We offer many different styles of engraved cocktail, scotch and whiskey glasses that are customized any way you like - we have a wide selection of fonts and designs, and we specialize in custom logos and artwork. More information can be found on the links above or at the bottom of this page. Our production time is only two to three business days. We don't charge for production Rush service, let us know if you're short on time and we'll do our best to get your order out sooner (does not affect shipping time). If you have any questions, please feel free to call or email! The Alfieri Whiskey Glass is a beautifully designed sophisticated crystal glass with a square glass base that softly curves out to be round at the top of the glass. Just imagine how this glass will look on your bar with your favorite whiskey shining spectacularly, complimented by your own design engraved into the glass. The Classico Double Old Fashioned is a crystal glass with a simple yet modern design that will fit perfectly in any man-cave. The perfect cylinder shape makes the glass an amazing canvas for detailed personalization. The On The Rocks Double Old Fashioned is a crystal glass features a square design with softly rounded corners and a base that's chock-full of interesting detail. The base of this custom glass is made to look like ice that reflects the vibrant ambers of both scotch and whiskey making it the perfect gift for the avid whiskey or scotch connoisseur. The Rossini Double Old Fashioned is crystal crystal glass that not only will catch your eye with the engraving you choose but also the glass itself is a unique masterpiece. The base starts off square with sharp corners but softens as it approaches the top which is universally round. Just picture the way you'll look and feel holding your new personalized glass with your favorite liquor glistening inside of this beautifully crafted glass. Your friends will think Picasso himself made this masterpiece! 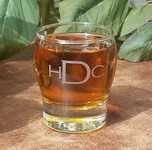 We offer many different styles of engraved cocktail, scotch and whiskey glasses that are personalized any way you like - we have a wide variety of fonts (click on the Fonts link under Personalize above to view our standard fonts), we can use most Windows fonts if we don't have your favorite font listed, and we can use whatever layout you'd like. We also offer (for a small additional charge) over 175 designs that can be added, along with text, to our Personalized Engraved Whiskey Glasses. Or you can get your company logo or custom designengraved, please see our Custom Design Instructions page for more information. Don't see what you're looking for? 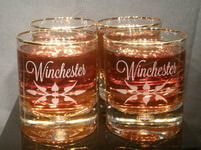 We also offer additional scotch and whiskey glasses that can be special ordered on our Special Order Whiskey Glasses page.